The best part of the project was that little had been done to the house. And the worst part of the project was that little had been done to the house. 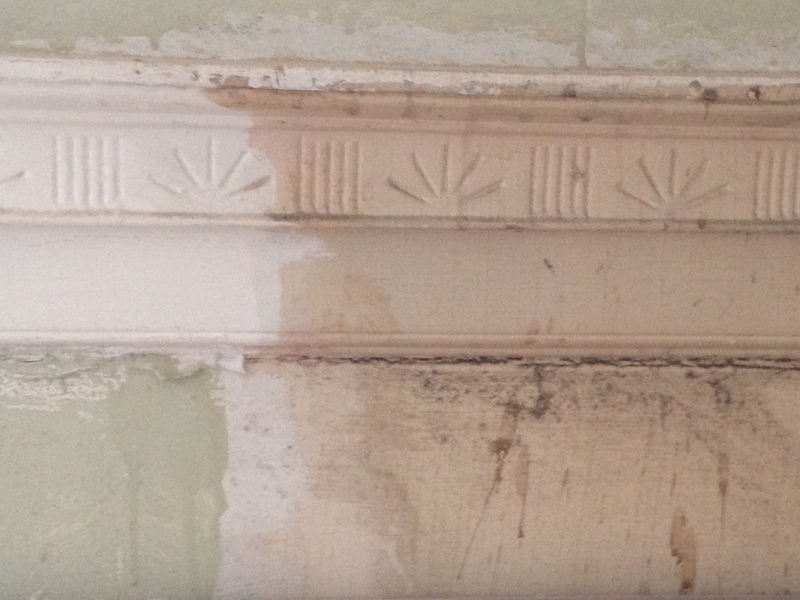 I’ve grown accustomed to this refrain that is common among those who’ve restored or renovated old homes. Having spent 25 blissful years writing about architecture and interior design for magazines, I’ve met many architects, builders, designers and homeowners from around the country who agree that rescuing historic architectural details and adapting antiquated structures to suit modern lifestyles is a feat likened to walking on a tightrope. Striking the perfect balance between capturing yesteryear’s romance and incorporating today’s necessities is always challenging. The Sherman House is a fine example of the Newport Federal style. 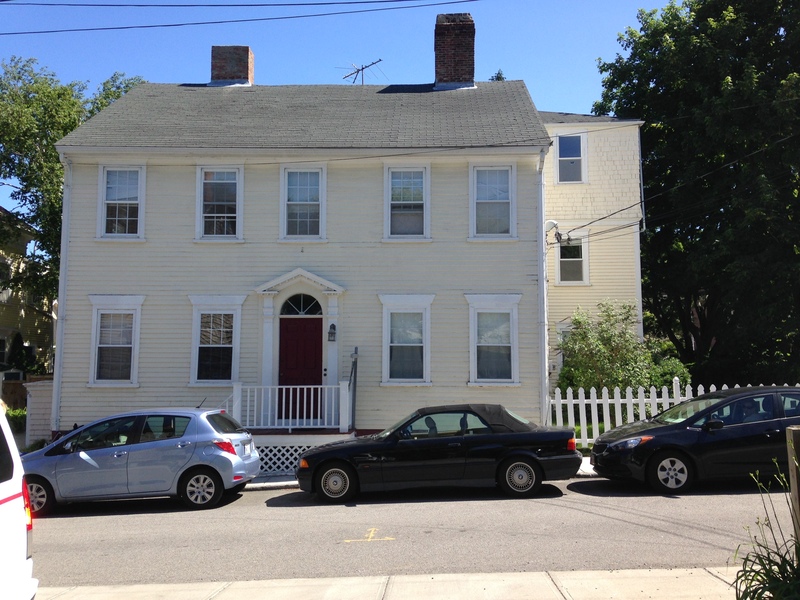 The home boasts original millwork, wide planked floors, six fireplaces, two parlors, several bedrooms, spacious attic and a pair of staircases. However, when we happened upon the property, the home was on the brink of ruin. A succession of families lived happily in the home for many decades. However, over the course of time they made little alterations and improvements to the home. The first time I saw the house in its sagging condition, the ghosts of magazine-articles-past echoed in my head. 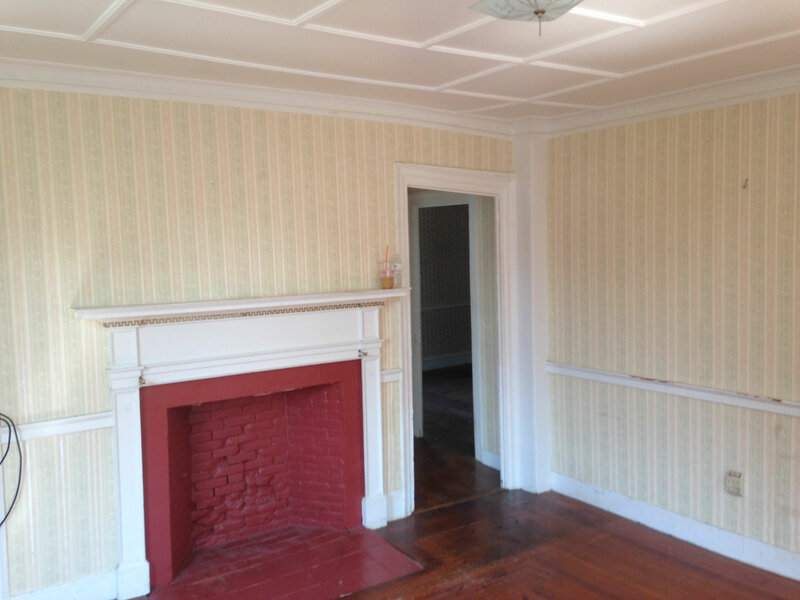 Not surprisingly, the house failed inspection with flying colors. I think the structural engineer may still be shaking his head in disbelief. 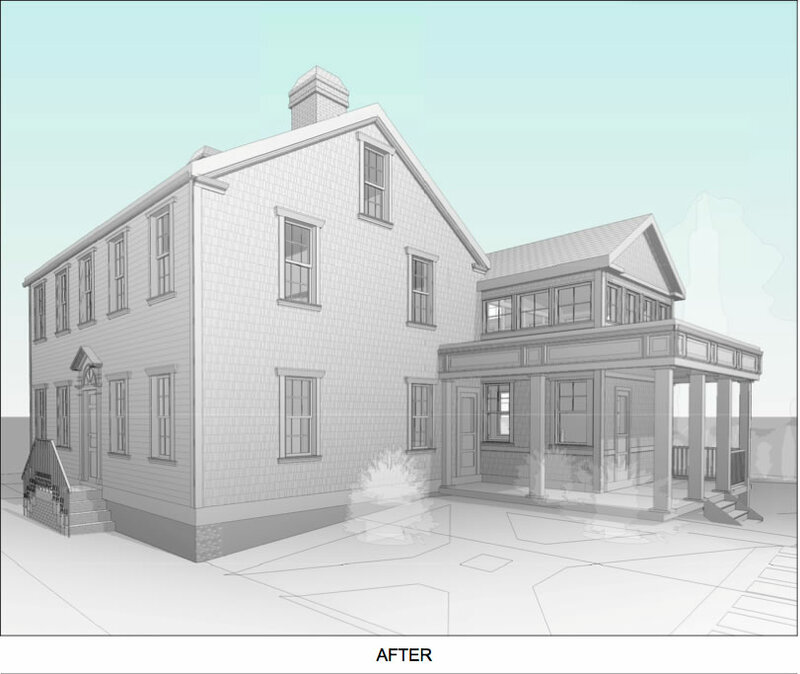 To bring this Historic Hill District house up to code, the short list includes replacing the asphalt roof with cedar shakes, replacing vinyl windows with true divided light wood windows with energy panels, adding new plumbing, installing new heating and cooling systems and rebuilding the chimneys and front stoop. John and I cherish Rhode Island’s rich architectural heritage and advocate preservation; but we do not envision having a docent greet family and friends at the door and then guide them past rooms cordoned off with red velvet rope. 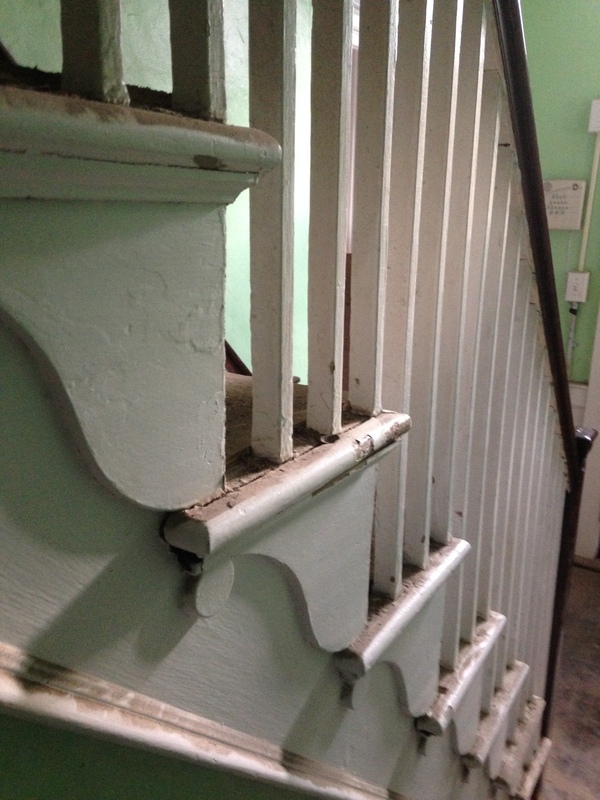 Our aim is to rejuvenate the Sherman House, preserve as much character as humanly possible, and reconfigure the spaces so the home is a joy to live in for the next two hundred years. 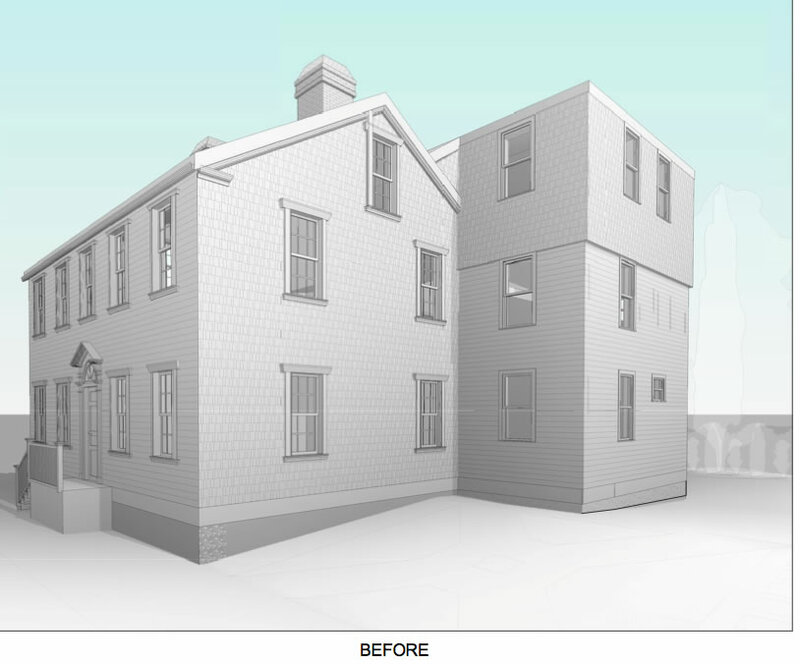 Some may think this odd, but we often try to imagine what future stewards of the Sherman House might think of our design decisions. We’ve all watched HGTV. (If I knew how to program the DVR, I would definitely record Fixer Upper — Joanne and Chip make ship lap look so beautiful!) Anyway, our favorite programs usually begin with a reciting of a dream home wish list. The mantra for most house hunters, remodelers and flippers includes: a modern kitchen perfect for entertaining, a quiet space that serves as a home office or retreat, spa-like bathrooms, rooms that connect to the outdoors, ample storage, and a first floor master bedroom designed for aging in place. John and I have these same aspirations for the Sherman House. Our rejuvenation project entails removing the awkward three-story addition on the back of the house and building a new kitchen and dining room; converting the front parlor into a first floor guest room with access to an ADA bathroom; adding closets to a home that has none; creating an attic studio; using antiques and architectural salvage to form transitions from old to new spaces; building a wrap-around porch; and planting a traditional boxwood and perennial garden. 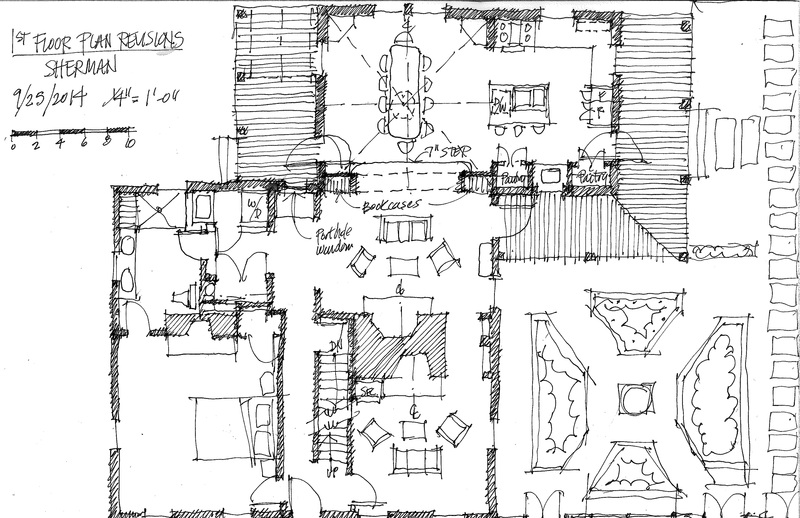 Sketch of new floor plan in the original house by John K. Grosvenor. 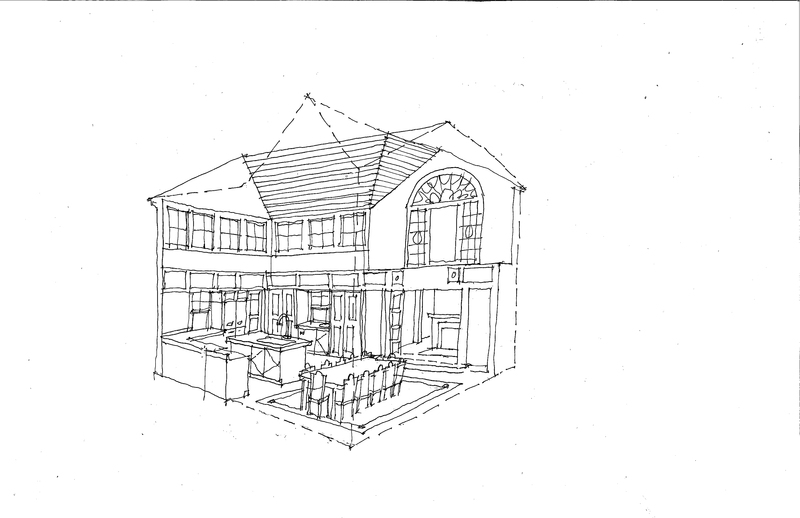 Sketch by John K. Grosvenor of the addition that will feature a kitchen and dining room. Some of the new design elements are not considered Federal but they respectfully accentuate the original house with contemporary ideals. 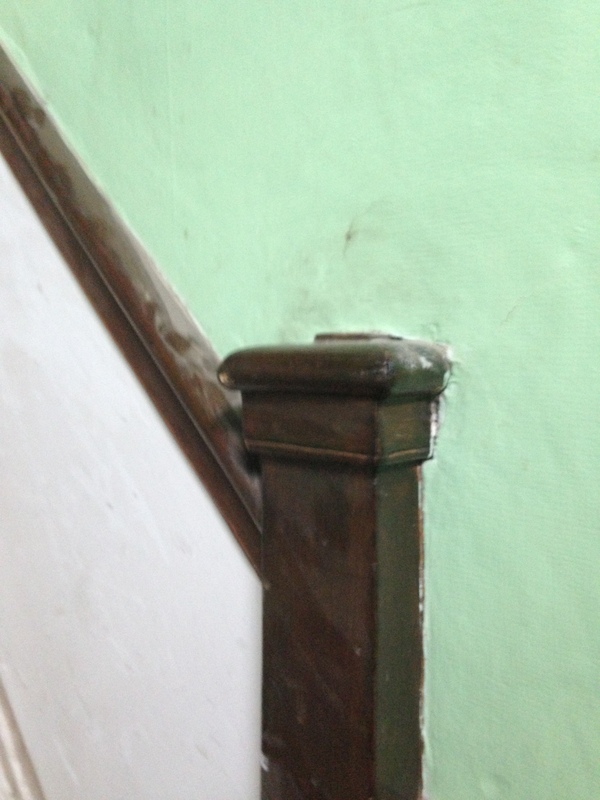 We will certainly strive to restore the original floors, horse hair plaster, mantels, chair rails, crown moldings, window brackets, stair brackets, and newel posts. These vestiges will continue to serve as poetic reminders of the brave Sherman family who chose to make Newport their home during the early 19th century. We hope to complete our rejuvenation project by next spring. Stay tuned to see how we progress. Woody Allen filmed a movie in our hometown of Newport, RI this past summer. Star gazing was a popular pastime among residents and tourists alike. On the day of our real estate closing, the cast and crew were setting up a scene beside our attorney’s office. Those assembled around the conference table divided their attention between completing paperwork and trying to catch a glimpse of the legendary filmmaker and co-stars Emma Stone and Joaquin Phoenix. As I peered through the window, I wondered, could this brush with fame be a good omen? Throughout the excitement, our star struck group managed to sign documents, exchange handshakes, and transfer house keys. We soon left Hollywood behind and dashed up the street to see our new home. When we pushed the front door of the 1811 Federal home open, we were overcome by an eerie silence. For the first time in more than two centuries, the entire home was devoid of furnishings, possessions, and the familiar cadence of families’ everyday comings and goings. 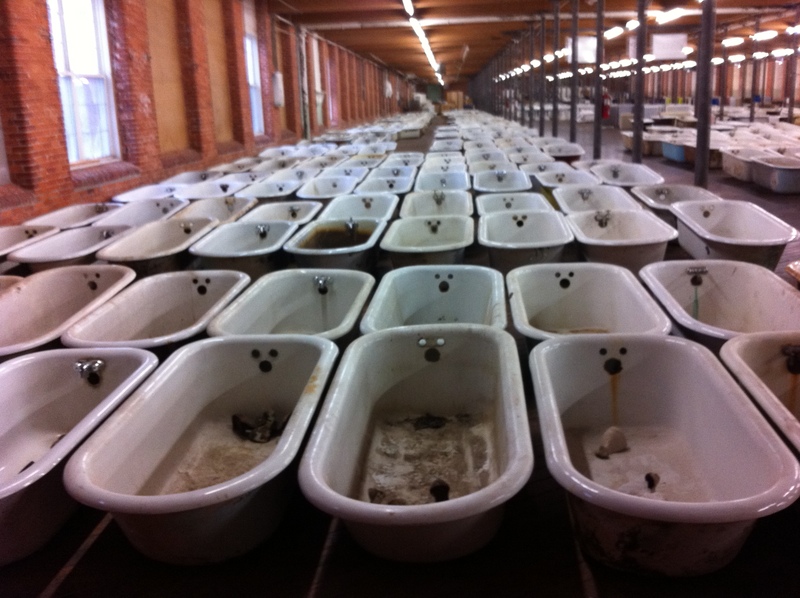 The emptiness and stillness allowed us to focus on those relics that endured the test of time. Six fireplace mantels, chair rails, crown moldings, newel posts, stair brackets and wide planked floors worked in tandem to assure us that this rejuvenation project was indeed worthwhile. When we reached the third floor, we happened upon a closet that contained an old bureau. We pulled a drawer open and to our amazement discovered an antique cottage clock. The house seemed to be giving us a gift. As we closely examined the charming timepiece, we suddenly realized that this was the sign we were hoping for. 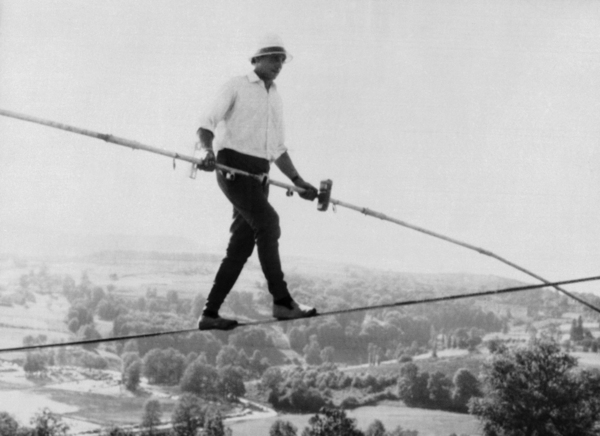 As the saying goes…..coincidences mean you are on the right path. And coincidentally, I have been collecting clocks for almost 20 years. 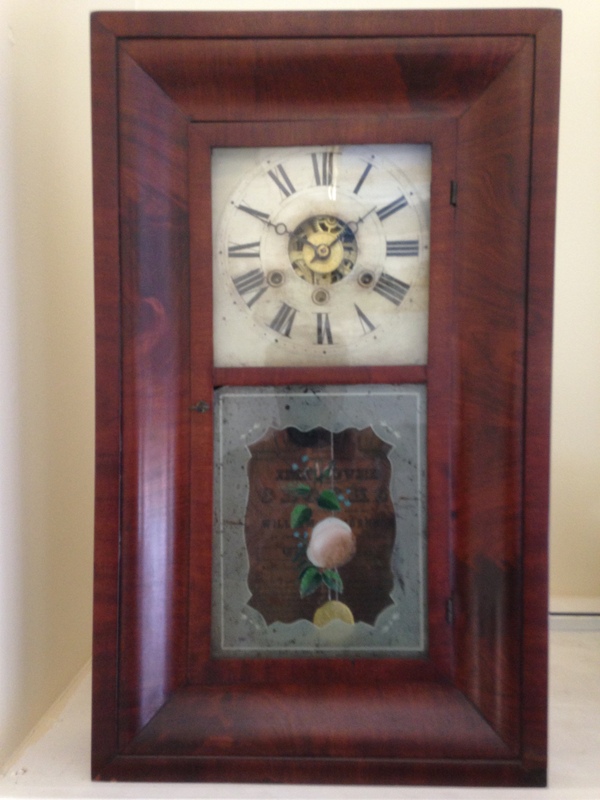 1860s Cottage Clock found in a bureau of the 1811 Federal home. For me and for many collectors, antique clocks are like potato chips; you can never have just one. The passion for collecting clocks usually begins so innocently. We come across an old clock in an antiques shop and think to ourselves, “Wouldn’t that look nice on my mantel.” Unaware of what is about to happen, we bring the clock home, polish the rosewood case, admire the reverse painting on the glass tablet, attach the brass pendulum, adjust the delicate clock hands, insert an adorable key, and wind. Then, as we listen to the scratching of the gears, the hypnotic tick tock of the pendulum and the melodic strike of the hour, a funny thing happens. We recognize that we did not buy a simple timepiece, we purchased a treasure, an object of art. And just like those potato chips, we crave another. Before you know it, we are combing antique venues and the Internet hoping to find our next clock. 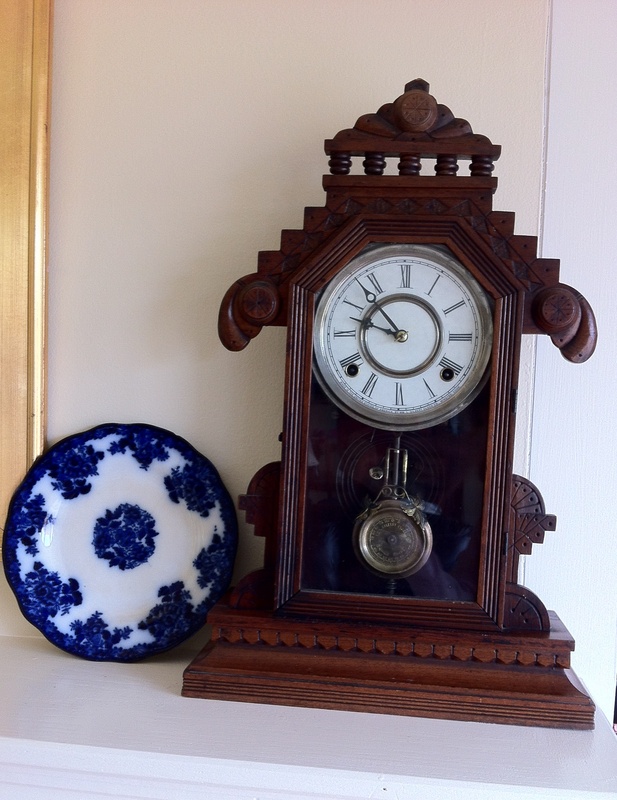 1850s Ogee Clock purchased from a collector in Rhode Island. Although clocks, or instruments used to mark time have been around for centuries, it was not until the early 19th century that clock making became an industry in the United States. Case clocks, mantel clocks, shelf clocks and wall clocks were produced in a variety of styles, sizes and price ranges. 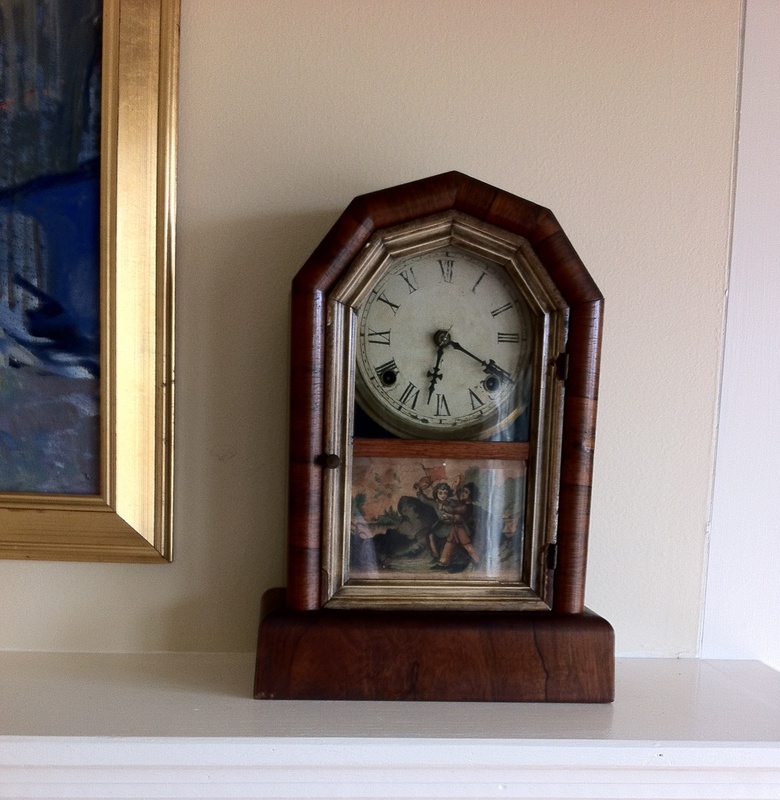 Many families during the Federal period owned at least one clock that was proudly displayed in the most prominent area of the house such as a foyer or formal parlor. During that time, a clock was considered a prized possession. One family member, usually the father, was designated the keeper of the clock and was responsible for winding the timepiece whose design artfully combined craftsmanship with technology. 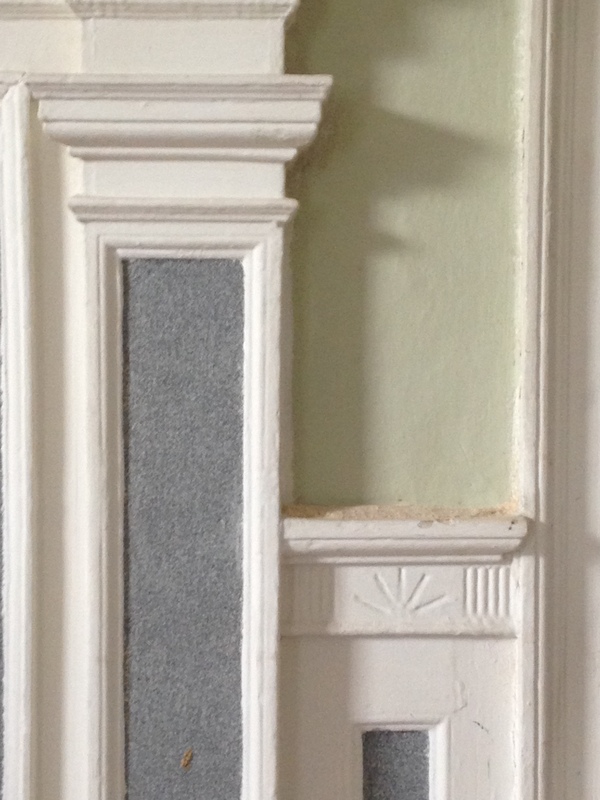 When we finish rejuvenating our home, each of the six fireplace mantels will be graced with an antique clock ranging from an Ogee wall clock, to a walnut gingerbread clock to a Mission Style shelf clock. 1880s Gingerbread Clock purchased from a collector in Rhode Island. 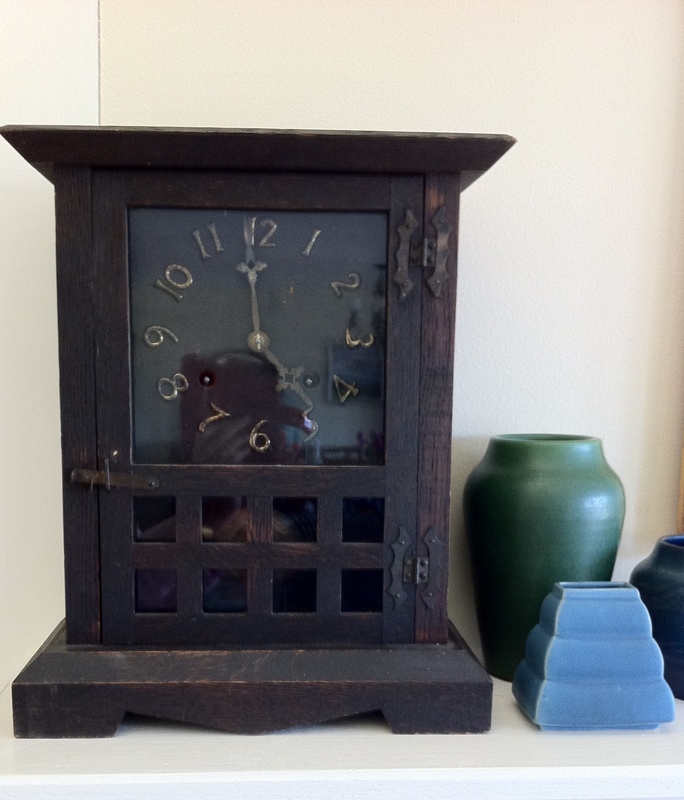 1907 Mission Style Clock purchased at an antiques shop in New Hampshire. Today, most people mark time on their smart phones. Simply tap the glass screen and the time of day suddenly appears. And If you need an alarm clock, simply tap the glass screen a few more times and by dawn a catchy mambo tune will interrupt your sleep. Rarely do we ever think of buying an old clock. However, an antique clock will lend romance and a hint of yesteryear to your home. Also, an antique clock is destined to become your very own family heirloom that you can pass down to the next generation. So the next time you wander through an antiques shop, flea market or estate sale, look for clocks. Don’t worry if the clock is not in perfect working condition. Sometimes a stopped clock will tempt us to slow down for just a moment or two and truly appreciate time well spent.